If you have ever had a pet, you know the pure joy and unconditional love that dogs, cats, and other furry friends can bring into our lives. In fact, studies suggest that cuddling or petting an animal can reduce rates of stress, anxiety, and even depression. These positive effects have inspired many hospice organizations to use pet therapy as way to increase the quality of life of patients with serious and terminal illnesses. Pet therapy, also known as animal-assisted therapy, is a guided interaction between a person and a trained animal. It is often used to help people cope with a mental disorder, or recover from a health problem. More recently, pet therapy has extended into the sphere of hospice organizations, with the goal of providing relaxation and companionship to people nearing the end of their lives. During hospice visits, the patients, family members, and caregivers can enjoy the company of the animals in a variety of ways. They can talk to and cuddle with the animal, play with it, or simply enjoy its presence in silence; whatever makes the patient feel the most comfortable. While dogs and cats are the most common therapy animals, rabbits, pigs, horses, and birds can also be great options, depending on the patient’s needs and wants. Volunteers with registered therapy pets are trained to engage with patients of any capacity. For example, pets may sit on the lap of a bedridden person, or lay their heads down on the feet of a person in a wheelchair. Typically, hospice organizations rely on volunteers to donate their time to offer this special service. 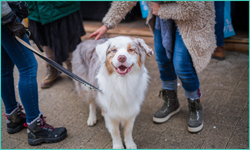 Bonding with therapy animals has demonstrated wonderfully positive results, including reduced blood pressure, reduced physical pain, and increased levels of relaxation. But the benefits don’t stop there. Animal-assisted therapy also has significant social and emotional benefits, including reduced feelings of loneliness and depression, and improved outlook on life. Patients who used to have pets of their own may feel sadness since they had to leave their own pets and homes behind, but therapy animals can help rekindle that spark of joy, and reconnect them to positive experiences from their past. Research suggests that animal-assisted therapy may even play a significant role in reducing dementia symptoms in Alzheimer’s patients. If you are interested in volunteering in a hospice pet therapy program, the first step is to attend a training for yourself and your pet. Most hospice organizations require that volunteers and pets be certified for safety reasons. 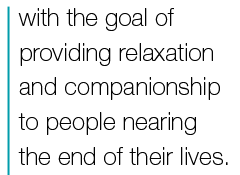 Pet Partners is a prestigious non-profit that registers pet therapy animals throughout the U.S. Those who work in hospice programs and are interested in adding a furry friend to their team can visit Therapy Dogs International for more information.